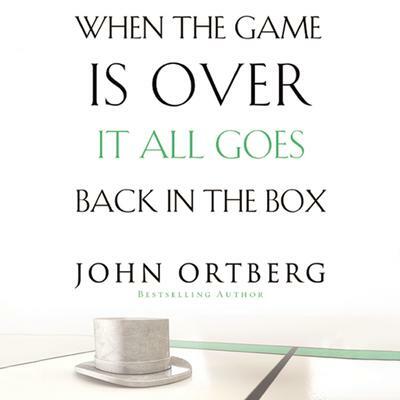 When the Game Is Over, It All Goes Back in the Box - Audiobook | Listen Instantly! Remember the thrill of winning at checkers or Parcheesi? You become the Master of the Board—the victor over everyone else. 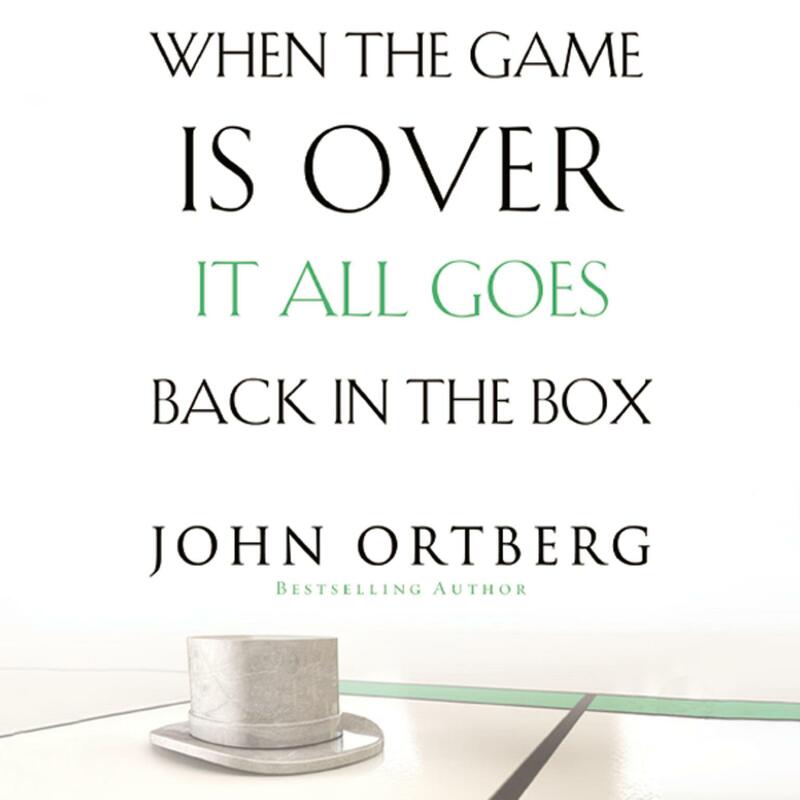 But what happens after that, asks bestselling author John Ortberg. You know the answer: It all goes back in the box. You don’t get to keep one token, one chip, one game card. In the end, the spoils of the game add up to nothing.Using popular games as a metaphor for our temporal lives, When the Game Is Over, It All Goes Back in the Box neatly sorts out what’s fleeting and what’s permanent in God’s kingdom. Being Master of the Board is not the point; being rich toward God is. Winning the game of life on Earth is a temporary victory; loving God and other people with all our hearts is an eternal one. Using humor, terrific stories, and a focus on winning “the right trophies,” Ortberg paints a vivid picture of the priorities that all Christians will want to embrace. Download and start listening now!
" Great book. I highly recommend all to read as it helped me put life into proper perspective as to what is truly important. All the other stuff goes back in the box and is not worth wasting my time on. " " Ortberg is one of my favorite Christian writers. This is his take on 'you can't take it with you.' Easy, non-judgmental read. " " Classic Ortberg: deep thoughts from a funny man "
" So many excellent points about life and way we live it. " " Awesome lessons to live by! " " Awesome. Thoroughly enjoyed reading it. So many things to truly think about, I made a lot of connections. Now what to do with my dash..... "
" This is a good book on Christianity and the thoughts echoed are nice. The narration dint appeal me much personally. There were times when I felt the author has made the point, established it and needs to move forward but chapter continues. I recommend this to people from Catholic background and anyone who is interested in understanding teaching of Jesus Christ. " " Inspiring its readers to put all in perspective;recommending to lots of folks. " " Very insightful. Want to reread once every year. Loved it! " " I really enjoyed this book and intend on buying a copy for several members of my family. Very thought provoking! " " This was a good book - I really liked the Author's style of writing, the quotes, the stories, the scripture to back it and in general the whole concept of the book focusing on what is really important and truly what our purpose is and should be. " " I love John Ortberg! He makes sense! :) "
" this book was fabulous. it was so thought-provoking. made you look at how you view your life, a very good, easy read. " " Very good and in your face "
" Love what it has to say about focusing on the things that are eternal instead of the things that are temporary. " " live a significant life, a life that will out live u "
" Excellent book to remind you of what's really important in life. " " Great book that reminded me that how I live my life right now is more than a game. " " Great, great, and great book. " " John Ortberg did not fail me in my expectations of this book! The book is a great reminder of what life is truly about. The writing style is interesting and easy to read. " " The single best book I have ever read on having a long view of life (eternal perspective). It is well written with great stories and contains incredible wisdom. I always thought if I were to write a book I would have written on this topic. Not sure I could have written this. Highly recommended. " " This is just an excellent book. Fast reading and filled with so much meaning. I loved it! I will be keeping it to re-read. " " This book was okay. Nothing earth-shattering... "
" Thoroughly enjoyable. The book is set up in "game instruction" format. Treats the topic of the tempral vs eternal with serious instruction, but keeps it light enough to keep you reading. Highly recommended. " " John Ortberg is a great author and he said some really good things in this book. It just wasn't my favorite...doesn't mean it wasn't a good book. May be because I got the audio book this time and maybe it doesn't seem as good as reading it??? Still LOVE John Ortberg! " " I don't normally really like books like this, but I liked the way this was written. Very organized and it gave me great resources for the future. " " I really liked this book as well and I think that people should learn about themselves and other people. It is a good book to read "
" I have enjoyed this book the most of all I've ready of Ortberg's books... "
It is true and yet we live like we have another day coming to us. So we compete and compare and it leaves us empty. Ortberg wants to change all of that and more. He wants us to truly live. " John Ortberg is a popular speaker and widely respected teaching pastor. Formerly at Willow Creek Community Church in South Barrington, Illinois, he is now senior pastor of Menlo Park Presbyterian Church in California. He creatively brings scripture to life through his use of practical application and humor. He’s the author of numerous books including The Life You’ve Always Wanted, Love beyond Reason, and If You Want to Walk on Water, You’ve Got to Get out of the Boat.